These three statements in the Bible all have something very significant in common. They all attribute to a supernatural cause, the action of God, results that appear, the more closely one studies them, more and more to have come about through natural processes. That is, these results look just like other results of their respective processes which are not said to have come about through the action of God. This does not mean that God is not the actor in these three cases; it simply means that God has not chosen to use a radically different process to bring about what is nevertheless a divine product. We have already considered, in an earlier post, that rainfall in the land of Palestine (the rainfall that is arguably in view in statements such as the one quoted above) is produced by the same process as the rain that falls on other parts of the world. We have also seen in earlier posts that the biological diversity that results from a process even the strictest creationists would consider “natural” rather than “supernatural” (“variation within ‘Genesis kinds’”) is quantitatively and qualitatively equal to, if not greater than, the diversity that results from what is understood to be divine activity (“special creation”). In this post and the three that follow, we will also establish that the Bible, for its part, bears all the marks of having been produced through the same process as human writings that are not considered divinely inspired. Once we have seen this and accepted it, we shall be free to ground our confidence in the Bible’s moral authority, which will still be entirely justified, on something other than the inevitably disappointing premise that it bears magical signs pointing to its divine origin. My co-author has already discussed one of these sought-after signs. He has related how he was taught that God supernaturally gave the biblical authors natural-scientific insights far transcending the observations it was possible for them to make within their limitations of time, place and culture. He faced deep disillusionment when he discovered that the biblical authors’ statements about the origins of the natural world—when read literally, non-contextually, and cumulatively, in keeping with the approach characteristic of those who appealed to them as a sign—could not in any way be considered “accurate” by scientific standards. When he came to appreciate the beauty and truth of these statements within the observational, phenomenological perspective from which they had actually been made, this offered some reassurance about the statements themselves, but a substitute was still lacking for the role they had once been asked to play. Before proceeding further with our discussion, it is instructive to recognize that even if the authors of the Bible had been given a supernatural awareness of true cosmology, and even if they had reflected this awareness in their writings, this would still not have provided an attestation of the Bible’s inspiration for just about any of its readers over the centuries. This is because, until the Copernican Revolution, the readers of the Bible held the same observational cosmology it actually presents. They would therefore have dismissed the Bible as inaccurate if it had instead painted a picture of a spinning earth and a stationary sun. 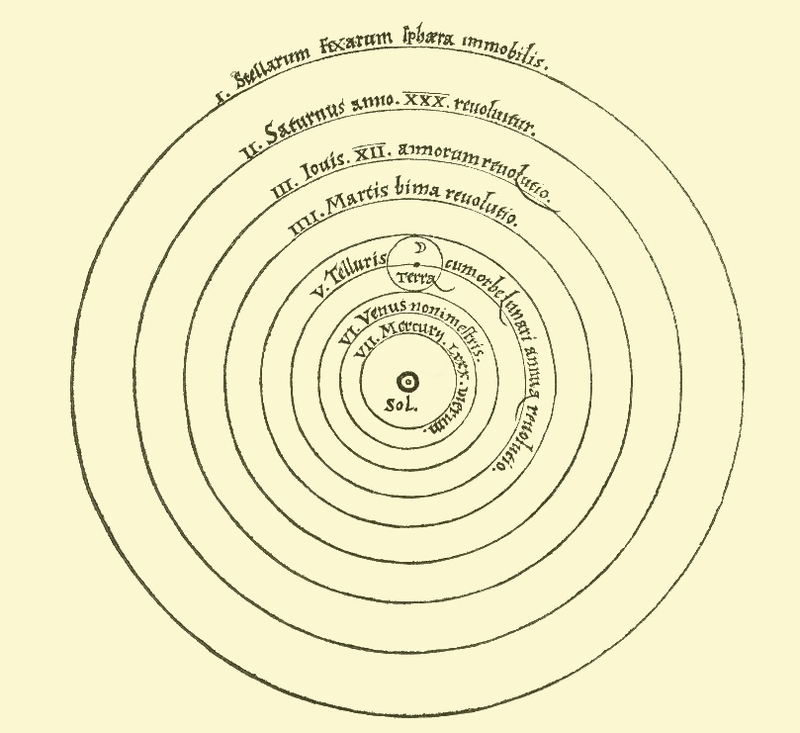 Nicolaus Copernicus’ model of the earth, moon, sun, and known planets from his 1543 work On the Revolutions of the Heavenly Spheres. A stationary sun and a moving earth were revolutionary concepts that explained the observed motions of heavenly bodies much more accurately and elegantly. Indeed, there is actually no cosmology that could have been put in the Bible that would have provided an attestation of its inspiration to any but a tiny fraction of its eventual readers. A Copernican cosmology would have been considered outdated in Kepler’s day; Kepler’s cosmology would not have provided an attestation in the present day; and it is virtually certain that even if the Bible presented a cosmology identical to the one we now believe to be accurate, a few hundred years from now this, too, would raise the same question we are addressing. The human understanding of cosmology has continued to grow and change over the centuries to such an extent that there is no period whose cosmology is correct by the standards of other periods. An observational cosmology, however, when it is recognized as such, travels to all periods, and was thus the best choice for the Bible itself. Even if God had somehow revealed the true cosmology to all humans right from the start, even this would not have permitted cosmology to provide an attestation of the Bible’s inspiration, because in such circumstances its cosmological insights, however true, would be nothing special. Another “sign” that is often pointed to as proof of the Bible’s divine inspiration and consequent moral authority is the accurate fulfillment of the prophecies it contains. How could the biblical writers have known the future, the argument goes, if they had not been inspired by God? But once again, if we look closely and carefully at what the Bible means when it speaks of its own prophecies being “fulfilled,” we discover that there is no magical testimony to the Bible’s divine authorship in this case, either. We do not have to look very far to make this discovery, in fact. The very first book of the New Testament, in its very first claim that a prophecy was fulfilled, rules out the understanding of “fulfillment”—a foreseen future coming to pass—to which appeal is typically made to demonstrate the Bible’s inspiration. Matthew writes that when Mary had borne a son, and Joseph had called his name “Jesus,” the prophetic word was fulfilled that said, “Behold, a virgin shall conceive and bear a son, and his name shall be called Emmanuel” (Matt. 1:22-25). We would expect that if Isaiah 7:14, the passage referred to here, really were a future foreseen and described, Mary would have actually named her son “Emmanuel,” not “Jesus.” So something different is happening here. The early chapters of Matthew present several other problems along this same line. In Matt. 2:23, for example, it is said that Jesus dwelt in Nazareth to fulfill what was spoken by the prophets, that he would be called a Nazarene. Yet nowhere in the prophetic corpus, nor indeed anywhere in all of the Hebrew scriptures, is such a prediction recorded. And when Jesus’ flight into Egypt and return to Israel after Herod’s death is said to fulfill Hosea’s words, “Out of Egypt have I called my son” (Matt. 2:13-15), the reader is puzzled indeed, because Hosea is writing history, not predicting the future, when he makes this statement. He is describing the Exodus (Hos. 11:1). A Coptic-style icon of the Flight into Egypt by the Bulgarian artist Yordanka Karalamova. Matthew says that this event “fulfilled” Hosea’s prophesy, “Out of Egypt have I called my son.” But Hosea made that as a historical statement describing the Exodus several hundred years before. In my understanding, the current cosmology is based on Einstein, but since Einstein’s model does not include Quantum Theory, we know there is something beyond that, but no one has solved this puzzle yet, as far as I know. In any case, Einstein posited that there was no privileged observer, that is, one observer is just as valid as another somewhere else. Perhaps surprisingly, this means that what you term the “observational” observer is a valid one according to Einstein, it is just that the equations get more complicated when the observer is on Earth. Also, since all observers are equal, astronomers get to pick one that simplifies their equations. Previous Previous post: 34 Observational cosmology, observational cosmogony?